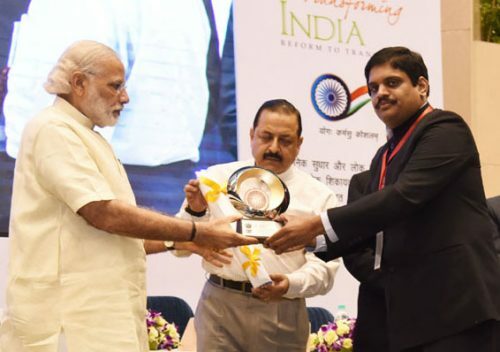 The Prime Minister, Shri Narendra Modi presenting the awards for Excellence in Implementation of Priority Programmes, at the 10th Civil Services Day function, in New Delhi on April 21, 2016. The Minister of State for Development of North Eastern Region (I/C), Prime Ministers Office, Personnel, Public Grievances & Pensions, Department of Atomic Energy, Department of Space, Dr. Jitendra Singh and the Additional Principal Secretary to the Prime Minister, Dr. P.K. Mishra are also seen.